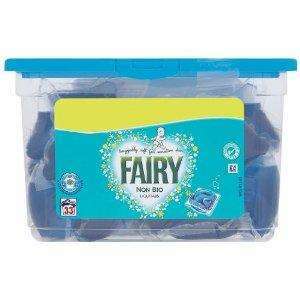 Was in Tesco this evening and found these on the half price cleaning stuff aisles, £6 for 33, very good me thinks. Updated, this is the 38 box not the 33. Super hot this deal should be. Cant buy this anywhere else for cheaper I think. So what if the gel is £3, if you seen this product in Asda for less then comment. But your comment is like comparing Apples to Pears. So what if the gel is £3, if you seen this product in Asda for less then … So what if the gel is £3, if you seen this product in Asda for less then comment. But your comment is like comparing Apples to Pears. It is the 38 wash pack I just checked. Hot I think.